This weekend marks the Diamond Jubilee of Elizabeth II. I remember the silver jubilee year, well, I remember my mom dressing me up as Britannia and sticking stuff to my riding hat (sorry I don't have a picture). I am sure if I was back in the UK I would be gung-ho about organising a street party but I am not, so we will hang some bunting up instead and I will maybe do something special at the weekend, we will see how the rest of the week goes... considering I spent almost 8 hours trying to fix my blog yesterday I am hoping the rest of the week runs more smoothly! 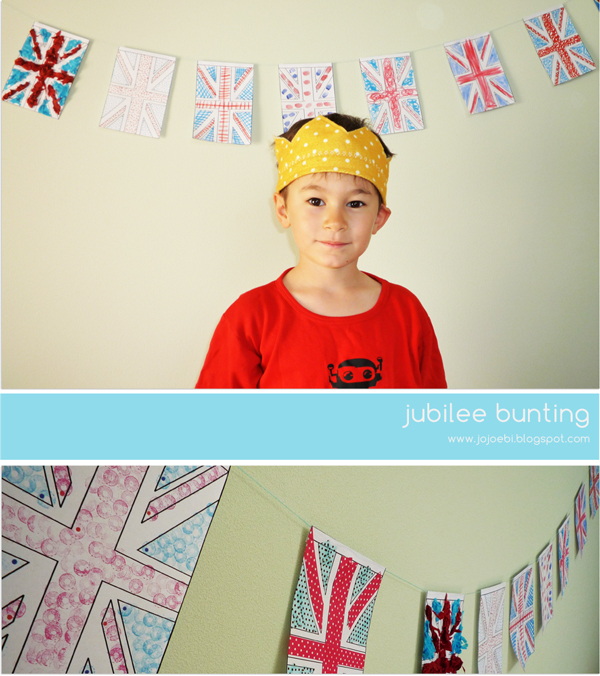 So, yesterday we made some bunting, the file is at the bottom of the post. 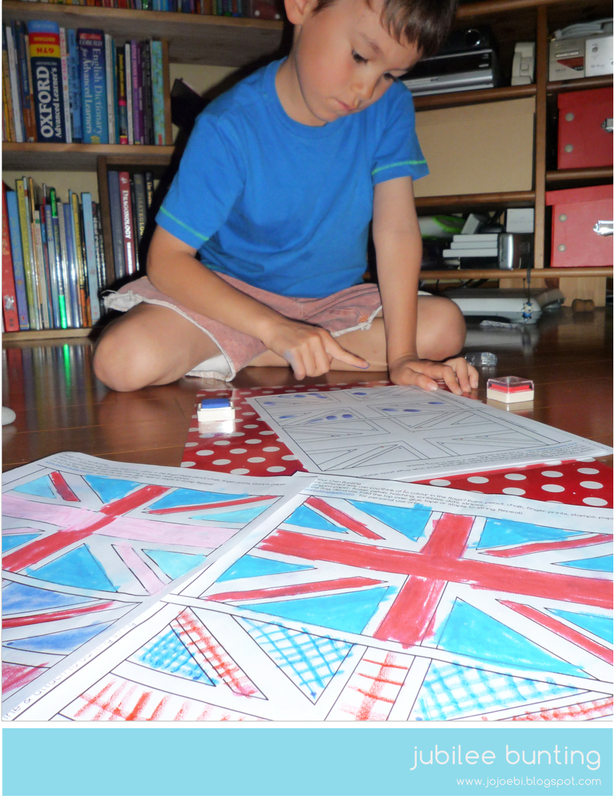 There are two union jacks (yeah, I know they are actually called union flags but who calls them that?) per page and I put small dots of blue or red in the sections that have to be coloured to make it easier for the kids to colour them in. We decided that every flag had to be different, so we got out the ink, pencils, crayons, tissue paper, wash tape, wax pastels, pens... and used a different medium or technique on each flag. Doing this worked for two reasons, first it would soon have got boring colouring in each flag the same and secondly it we could compare the flags when they were done and talk about which we liked the most/least and why. All you need to do is colour in the flag, cut it out, leave the top attached. Fold over the top and attach to some string, hang it up and.....taa-daa! I found a load of jubilee printables at the Activity Village and the official jubilee website has lots of info if you are planning on studying it with your kids. 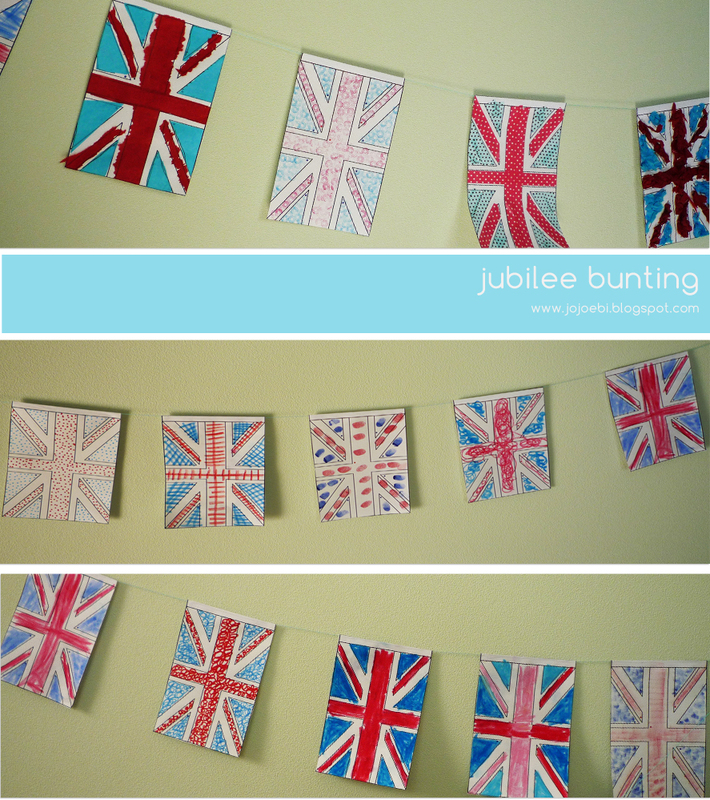 If you are celebrating the jubilee in some way, let me know what you are doing!